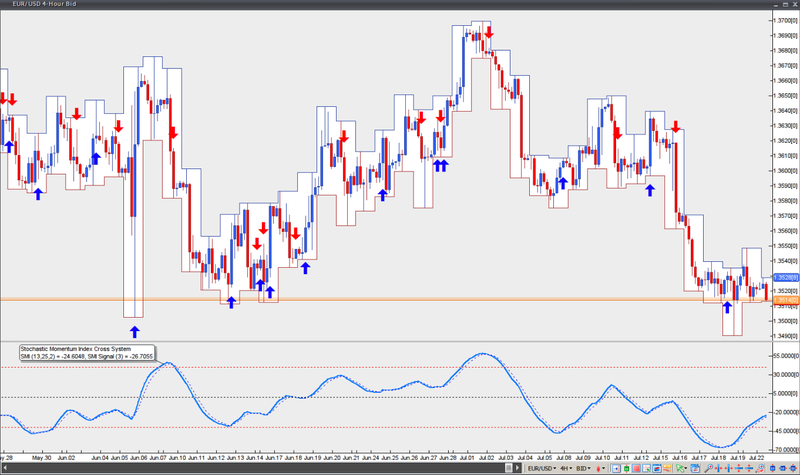 If you have any questions or suggestions you are welcome to join our forum discussion about Stochastic Momentum Index. Developed by William Blau and introduced in the January 1993 issue of Technical Analysis of Stocks and Commodities magazine, the Stochastic Momentum Index (SMI) is quicker compared to the popular traditional Stochastic and helps a trader to identify where the current close has occurred relative to the midpoint of the recent high to low range, based on price change in relation to the range of the price. Raw price differences are then smoothed using a double EMA, or an Exponential Moving Average of the Exponential Moving Average of the raw differences in price. If the closing price is above the midpoint of the range, the Stochastic Momentum Index is positive. If the closing price is below the midpoint of the range, the Stochastic Momentum Index is negative. First, taking advantage of overbought and oversold conditions. An overbought condition occurs, when the SMI is at or above its +40 level. An oversold condition occurs, when the SMI is at or below its -40 level. Signals are generated when the SMI crosses these extremes. In case the SMI crosses below -40 and then moves back above it, a signal to buy is generated. In case the SMI crosses above +40 and then moves back below it, a signal to sell is generated. Second, crossovers between the SMI line and the signal line. A signal to buy is generated, when the SMI line crosses above the signal line. A signal to sell is generated, when the SMI line crosses below the signal line. Using this approach, however, may lead to a lower percentage of winning trades. In order to avoid low probability signals, a trader may add a neutral zone to the oscillator at the levels -15 and +15. This way if he/she makes a short entry on a crossover, that occurs at the overbought level (+40) or above it and after that another crossover takes place in the -15/+15 neutral zone, the trader will not reverse his/her position, but will instead wait to see how the market reacts to the relative resistance on the present move down. If the market moves through the neutral zone and the trend remains intact, the trader may decide to add to his/her position or to place a tighter stop. Third, searching for divergences between the price and the SMI in order to identify a potential trend reversal or trend continuation setup. There are two types of divergences – regular and hidden. Regular divergences signal trend reversals, while hidden divergences signal trend continuation.